A galaxy cluster, or cluster o galaxies, is a structur that conseests o onywhaur frae hunders tae thoosands o galaxies that are boond thegither bi gravity wi teepical masses rangin frae 1014–1015 solar masses. 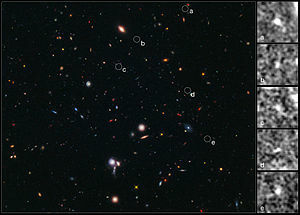 ↑ 1.0 1.1 "Hubble Pinpoints Furthest Protocluster of Galaxies Ever Seen". ESA/Hubble Press Release. Retrieved 13 January 2012. This page wis last eeditit on 17 Julie 2016, at 20:35.